Irtiqa: Is Flying Spaghetti Monsterism really a religion? It appears that this question will be addressed at the annual meeting of the American Academy of Religion (AAR). (If you don't know about Flying Spaghetti Monster, you can get more information from the Church of the Flying Spaghetti Monster). The annual meeting of AAR in San Diego has a panel that will be addressing the role of parody religions and the definition of religion itself (full story here). The title of the panel is Evolutionary Controversy and a Side of Pasta: The Flying Spaghetti Monster and the Subversive Function of Religious Parody. The authors recognize the topic is a little light by the standards of the American Academy of Religion. "You have to keep a sense of humor when you're studying religion, especially in graduate school," Van Horn said in a recent telephone interview. "Otherwise you'll sink into depression pretty quickly." But they also insist it's more than a joke. Indeed, the tale of the Flying Spaghetti Monster and its followers cuts to the heart of the one of the thorniest questions in religious studies: What defines a religion? Does it require a genuine theological belief? Or simply a set of rituals and a community joining together as a way of signaling their cultural alliances to others? 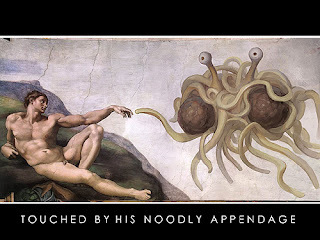 In short, is an anti-religion like Flying Spaghetti Monsterism actually a religion? Joining them on the panel will be David Chidester, a prominent and controversial academic at the University of Cape Town in South Africa who is interested in precisely such questions. He has urged scholars looking for insights into the place of religion in culture and psychology to explore a wider range of human activities. Examples include cheering for sports teams, joining Tupperware groups and the growing phenomenon of Internet-based religions. 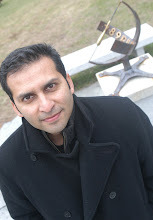 His 2005 book "Authentic Fakes: Religion and American Popular Culture," prompted wide debate about how far into popular culture religious studies scholars should venture.